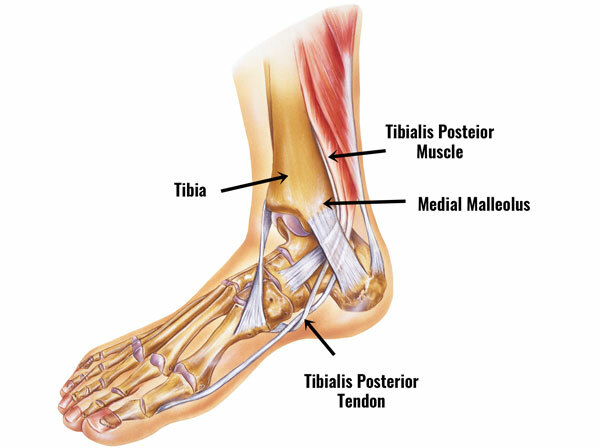 Tibialis posterior tendinopathy is an overuse injury causing pain on the inside of the ankle. 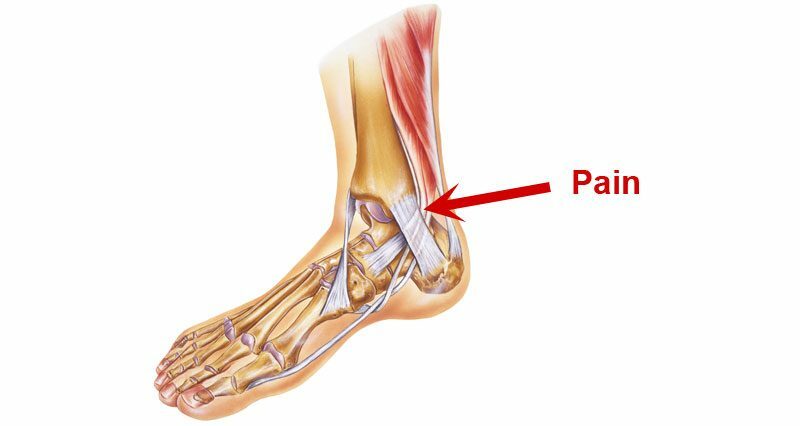 Pain is felt on the inside of the ankle which may radiate under the arch of the foot. It is more common in older female athletes and younger ballet dancers. Symptoms include pain on the inside of the ankle, behind the medial malleolus (bony bit on the inside of the ankle) which comes on gradually over time. It may be a niggle that the athlete continues to train with for some time. Pain may also radiate along the length of the tendon as it passes under the foot. A creaking sensation called crepitus can sometimes be felt when the tendon moves. There is unlikely to be swelling in the early stages but later there may be some around the back of the malleolus. If there is significant swelling then an acute partial tear of the tendon may be suspected. Pain may be made worse by passive eversion or resisted inversion. Passive eversion is when a therapist turns the foot outwards to stretch the tibialis posterior and resisted inversion is when the patient turns the soles of the feet inwards as the therapist resists to stress the tendon. Another test a professional therapist might do is to view the athlete from behind performing a heel raise on a step. If they have posterior tibialis tendinopathy then they may have difficulty keeping the ankle straight (it will remain rolled in/flattened) and severe cases they will have difficulty doing a heel raise altogether. If there is significant pain under the foot then this may indicate a partial avulsion where the tendon pulls away from the bone at the attachment to the navicular bone. The tibialis posterior muscle passes down the back of the leg and under the medial malleolus, or bony bit on the inside of the ankle. It inserts on the lower inner surfaces of the navicular and cuneiform bones in the midfoot and the base of the 2nd, 3rd, 4th and fifth long metatarsal bones under the foot. It is used to plantarflex the foot (going up on your toes) and to invert the foot (turning the soles of the feet inwards). Tibialis posterior tendonitis is an overuse injury and is thought to be due to degeneration of the tendon rather than acute inflammation. It is most likely to affect older female athletes who do lots of walking or running. Athletes who overpronate, where the foot rolls in or flattens too much are at increased risk as this places more strain on the tibialis posterior muscle causing it to repeatedly overstretch and overwork more that if would with normal foot biomechanics. Sports and activities that increase the risk of tibialis posterior tendinopathy are those which require prolonged stretching of the tibialis posterior and include ballet dancing, ice skating, and sprinters, particularly running on tight bends indoors. Long-term injuries to the tibialis posterior can result in insufficiency of the muscle and a condition called tibialis posterior dysfunction (PTTD) which results in fallen arches, or flat feet. There is sometimes confusion between PTTD and tibialis posterior tendinopathy and the terms are often used interchangeably. However, these conditions are slightly different as PTTD is a dysfunction of the muscle and tendinopathy is a degeneration of the tendon. Re-establish neural control and coordination. Apply the PRICE principles of protection, rest, ice, compression, and elevation. Ice or cold therapy to reduce pain and inflammation. Ice should not be applied directly to the skin but in a wet tea towel. Commercially available hot and cold packs are often more convenient. Cold therapy can be applied for 10 minutes every hour for the first 24 to 48 hours if the tendon is painful or inflamed. Later on, after the acute stage, heat may be more beneficial. Compression – use a tube grip bandage or taping. Even better are products that specifically apply compression at the same time as cooling. When pain allows, stretching exercises for the tibialis posterior and calf muscles should be done. Specific exercises for the tibialis posterior will strengthen the muscle which should help prevent future injury. Applying electrotherapy such as ultrasound can help with pain and inflammation. A doctor may prescribe anti-inflammatory medication such as Ibuprofen in the short-term to reduce inflammation, although long-term they are thought to be of little benefit. Always check with a doctor before taking medication and do not take ibuprofen if you have asthma. Cross friction sports massage techniques may be applied to the tendon and deep tissue massage to the tibialis posterior and calf muscles may help increase flexibility and condition of the muscles. A sports injury professional can demonstrate, advise and monitor a rehabilitation program to strengthen the ankle and in particular, the tibialis posterior muscle. Orthotic inserts can be prescribed and fitted if required to correct poor foot biomechanics. If the tendon is ruptured then it must be repaired surgically. The guidelines below are for information purposes only. We recommend seeking professional advice before attempting any rehabilitation. Exercises can begin as soon as they can be performed without pain and the athlete should be able to maintain fitness by swimming or cycling if pain allows. Strengthening exercises for Tibialis posterior tendinopathy focus on developing strength and eccentric strength, in particular, in the tibialis posterior muscle which plantarflexes and inverts the ankle. This should begin as soon as pain will allow. If it hurts to perform any of the exercises then wait longer until there is no pain. Perform ankle circle movements in the early stages to keep it mobile. Stretching the calf muscles and tibialis posterior muscles at the back of the lower leg are important. Make sure you stretch the calf muscles with both the knee straight and the knee bent. This will ensure all muscles in the back of the lower leg are stretched thoroughly. Perform stretching exercises 2 to 3 time a day. These exercises will specifically strengthen the tibialis posterior muscle. It is important that the athlete has given the tendon enough time to heal before attempting strengthening exercises. The exercises is performed by moving the ankle from an everted position to an inverted position using the exercise band for resistance. In a seated position, wrap a resistance band around the foot and either attach it to something to the outside of the foot, or get someone to hold it. Invert the foot against the resistance of the band. Ensure you are only using the ankle/foot to perform this movement and not the lower leg/knee. Slowly return to a neutral position and repeat. Start with 10 repetitions and gradually increase to 20 reps.
Isometric exercises are often done in the very early stages of rehabilitation and do not involve movement of the ankle. A therapist provides resistance as the athlete tries to push the foot outwards against their resistance. There shouldn’t be any movement in the ankle, just use the muscles to resist. This is the first exercise which can be performed after injury as it places the least stress on the tendon. This exercise is a more advanced tibialis posterior muscle strengthening exercise, using bodyweight as resistance. Stand (in bare feet) long ways on a step with the inside of the foot halfway over the step. Gently roll the foot inwards (evert or pronate) so the inside of the foot rolls in and downwards. Return to the starting position by inverting it so it is flat on the step again. Aim for 3 sets of 10 repetitions and gradually build up to 3 sets of 30 repetitions. This exercise will also strengthen the calf muscles (Gastrocnemius and Soleus). Stand with your feet on the floor, shoulder width apart, close to something to hold on to. Rise up on to your tip toes as high as possible. Lower the heels back down to the floor. You should be able to progress quite quickly with this one but aim for 3 sets of 10 and build up steadily, a few each day. You can then progress to performing on single legs. Focus on keeping the ankle straight and not allowing the foot to flatten as you push up. You can also perform these on a step so that the heels drop down below the level of the step. Apply ice/cold therapy after stretching in the early stages of rehabilitation to help reduce any inflammation that may occur after exercises. These exercises focus on improving balance and coordination. Try balancing on one leg with your eyes closed. This will improve proprioception (the neuromuscular control you have over your muscles). This is frequently damaged in foot and ankle injuries and help to prevent you from suffering future injuries. The athlete begins by standing on the injured leg only for 30 seconds. Once this is accomplished the athlete closes their eyes to increase the difficulty. The next step is to balance on an unstable surface such as a trampette, wobble cushion or half foam roller. A wobble board is a useful piece of kit to have. It is a flat board that you stand on with a semi-spherical bottom. By balancing on this you strengthen the ankle and improve proprioception (balance). The heel-toe balance exercise, sometimes called a tandem stance is designed to start to work on proprioception and balance. This is a good build-up to wobble board work. The athlete stands with the involved foot immediately behind the other foot, with the toes touching the front heel as shown. This position should be held for 30 seconds without losing balance. Heel-toe walking is a great exercise for the ankle and calf muscles. It will strengthen all muscles of the lower leg, as well as help, improve proprioception or balance. Walk slowly across the floor. Start with a heel strike and once you get to the forefoot push-off, come up onto the toes. Swing the other leg forward and heel strike with the next foot to continue. When the athlete can comfortably do all of the above exercises without adverse reaction then they are ready to start the next phase and begin to return to activity. The range of motion exercises and stretching should continue. Maintain and improve on what has done in the previous phase. Begin running as long as it is not painful. Start with a gentle jog/walk program and gradually build up the time spent running. Once running in a straight line for 10 minutes is comfortable, gradually introduce corners and changes of direction. Full range of motion without pain. Good strength in the ankle which is equal in both legs. No pain or swelling present either during exercise, after or the following day. Restored proprioception (able to balance on one leg with eyes closed). They may be ready to return to competition and full training.